Robotic suit helps kids with cerebral palsy walk tall #WearableWednesday « Adafruit Industries – Makers, hackers, artists, designers and engineers! The researchers recently demonstrated in a study that the exoskeleton — which looks more like superhero armor than medical equipment — was safe and well-tolerated and could be worn while the children walked on their own. The researchers also demonstrated that improvements in walking with the exoskeleton increased over time as the children continued to use it, according to the study, published in August in the journal Science Translational Medicine. The researchers found that, as the children walked across the lab floor, the exoskeleton reduced crouch by changing their posture and assisting in the extension of their knees. While wearing the exoskeleton, six of the seven children showed posture and walking improvements equivalent to or greater than improvements typically seen from invasive orthopedic surgery, the researchers noted in the study. 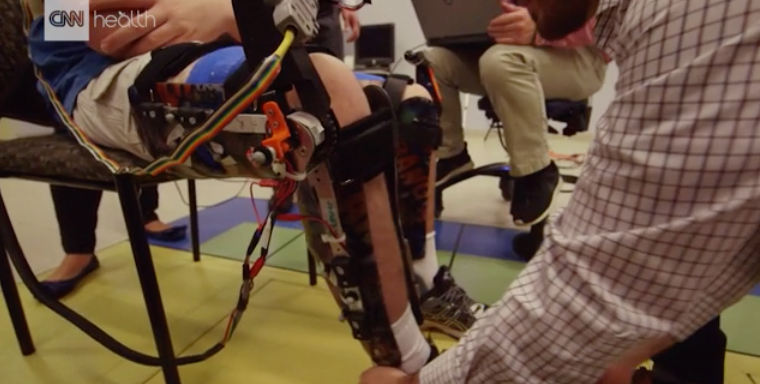 “Most of the children were pretty excited to feel the way that this device changed how they walked,” said Thomas Bulea, staff scientist in the center’s Rehabilitation Medicine Department and lead author of the study.